With Wine “Screw Off” Is A Good Thing! They say you can’t teach an old horse new tricks. As Wine Enthusiasts we are going to have to start teaching new tricks to these old horses. I have been told for years by serious wine consumers, “The day they stop putting corks in wine bottles is the day they will stop drinking wine”! I feel so sorry for these people because I feel just the opposite. There is a shortage of good cork trees. Many corks are tainted with a bacteria called TCA and this will taint your bottle of wine to smell like wet cardboard mixed with mildew in your shower. This terminology is called “Corked”. Recent studies still show that 1 in every 12 bottles with a real cork in it is going to be “Corked”. I have found from personal experience on occasion 3 bottles in a case of wine I purchased to be “Corked”. When a server or sommelier brings you the bottle of wine you ordered and pours you that first sample, the rookie swirls it around like they see people do in the movies, smells it, takes a big taste and tells the server whether to pour a full glass. Trust me, I’ve worked in many fine dining restaurants. They are laughing at you when you do that. The server or sommelier doesn’t really care whether you like the wine you ordered. In fact, most red wines can’t even be judged until they have been open to aerate or breathe for at least 1 hour prior to drinking. They do care however if the wine is “Corked” or not so they can replace it with one that is not. You don’t need to taste the wine in most obvious cases to detect that just like you don’t need to check if there is a skunk in your trunk. One good whiff and you will know when a wine is “Corked”. The above pictures are that of a closure for Wine Bottles known as “The Stelvin Closure”. To most people it is a screw off cap. That is where the psychology comes to play. Years ago, if a bottle of wine had a screw cap on it, people thought that meant you were buying a cheap bottle of poor quality wine. The new Stelvin Closures are totally different and more and more wineries including some bottles that cost $200 or more are starting to produce wines with Stelvin Closures instead of Corks…YIPPEE!!. Here are some reasons why I believe in Stelvin Closures: We’ve already established the Corked situation with natural cork. What about those synthetic corks or rubber corks? Synthetic corks, derived from plastic, appeared to be a viable alternative to traditional corks. However, their track record has been tarnished due to their inability to keep oxidation at bay for any real length of time, significantly decreasing the shelf life of a wine and short-changing the maturing process of select wines. With both regular corks and synthetic corks, the bottles don’t provide enough of a tight seal and they still let about 5% Oxygen in the bottle which causes every single bottle of wine from a specific vintage to have a slight variation in flavors from one to the other. 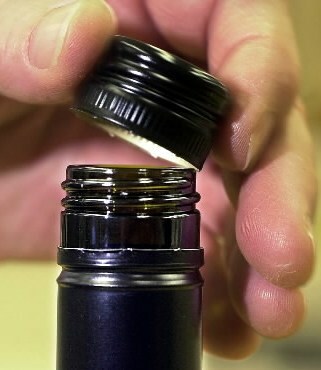 Screw caps provide the best seal for bottled wines, and eliminate the “corked” and oxidation problem in one fell swoop. 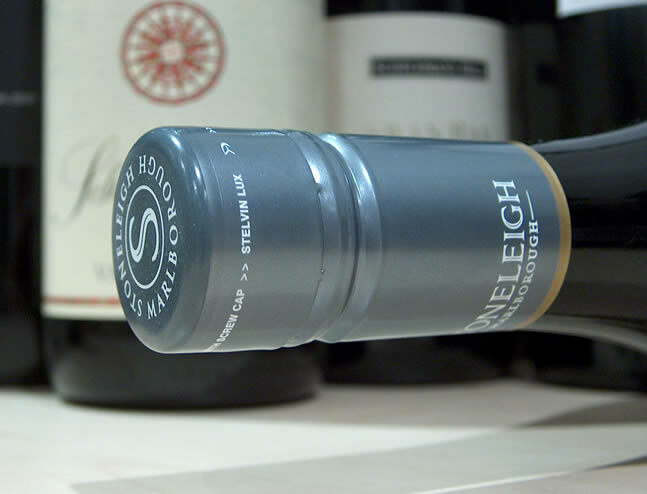 Hogue Cellars completed a 30-month study comparing natural and synthetic cork closures with the Stelvin Closures, their findings suggest significant benefits in utilizing screw caps over either natural or synthetic cork closures. While, screw caps do diminish the drama and romance of bottle opening it is well worth the sacrifice to ensure a taint-free wine that offers consistent aging, maintained flavor and freshness with optimum quality control. I even saw a study where a huge producer in Chablis, bottled half of his vintage with Corks and the other Half with Stelvin Closures. !2 % Of his bottles with Natural Corks were “Corked”. Each bottle of wine with a cork that the winemaker tasted had a slight variation. All bottles with his $300 Grand Cru Chablis that had Stelvin Closures were all in perfect condition and more importantly, each bottle tasted exactly the same and how the winemaker wanted to express that vintage of Chardonnay. Last but not least, if you buy a bottle with a natural cork for a special occasion to hold on to in your cellar to take to the restaurant to celebrate, what do you do if you get the 1 in 12 that was “Corked” 20 years later? 1- You order a bottle off of a Restaurant Wine List that is marked up 3-4 times so you can still celebrate. 2- Do you go to the Retailer you purchased the wine 25 years ago and ask for a refund if you even saved the receipt or if they are still in business? Now Lastly, wine bottles with natural corks have to be stored laying on their sides to prevent the corks from getting brittle. Stelvin Enclosures can be stored standing up and once again never a problem with tainted wine anymore. So come on Italy and France and Spain. Get on board. Do you want the Romance and Drama of opening a cork versus perfect bottles everytime with consistency in the taste of each bottle? To all wine consumers who keep telling me they refuse to buy a wine with a Stelvin Closure or Screw Cap as it totally goes against their principles and embarasses them to give those bottles as a gift. I say to those consumers to enjoy buying wine that is worry free for cellaring or for drinking now. Welcome and Embrace the STELVIN. Doesn’t everyone want CLOSURE in life? One in 12 bottles? Really? Do you support that assertion yourself? PreviousItalian Varietals With Passover Food? What Am I Chopped Liver? NextWines For Chillin’ And Grillin’ As Summer Approaches!